Note: The technology referenced toward the end of this article would be based on an Open Hyperdocument System (OHS). 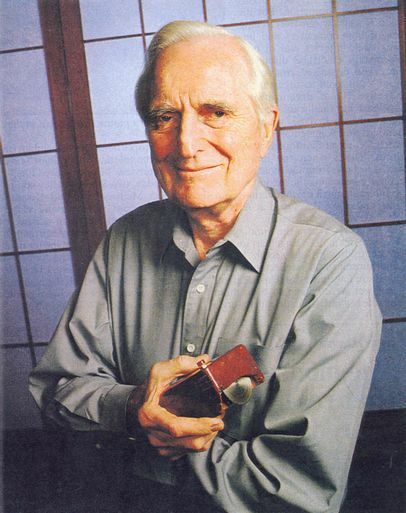 Doug Engelbart is seated on a sofa in a quiet corner of his home in Atherton, Calif. On the shelf above him is a book titled The Magic of Thinking Big--which is what he is best known for. Today, he is thinking of a complex system, a freeway at rush hour. But his thoughts are not confined to the present as he explains the difficulty of expressing concepts for which past experiences offer no frame of reference. "You realize when you merge onto a freeway that you're betting your life on what you see in that little rearview mirror, and yet you don't think anything of it," Engelbart says in his soft, grandfatherly voice. "Now, think back to 1905 and what people used mirrors for. Nobody at that time would have ever thought of betting their life on what they could grok at 60 miles an hour with a few glances in a vanity mirror." Grok is a favorite term of the 71-year-old Engelbart. It means to comprehend immediately, and it first appeared in the 1960s at a time when, it could be said, Engelbart was grokking the digital future. The mouse, on-screen windows, hypertext and many of the other innovations that define computing today are the direct result of Engelbart's work back then. "Yet," says Paul Saffo, a director of the Institute for the Future, "all the brilliant things he has produced are mere baubles compared to the ideas he's trying to get across." Those ideas are based on the premise that the complexity and urgency of the world's problems are increasing at a rate that is greater than mankind's ability to cope. Engelbart's solution is bound up in his idea of augmenting the collective IQ of organizations through a process known as bootstrapping. Though these ideas have driven him for the better part of 45 years, to the outside world they remain largely ungrokked. Visionary. That's why Engelbart is relatively unknown beyond the high-tech community. Yet ask almost any executive in Silicon Valley and he or she will describe him as a visionary so far ahead of his time that he has often had difficulty explaining his concepts to those rooted firmly in the present. "I've always thought of [Engelbart] as the father of personal computing," says Alan Kay, a senior fellow at Apple Computer who is often referred to by that title. In his 1985 book, Tools for Thought, Howard Rheingold called his chapter on Engelbart "The Loneliness of a Long-Distance Thinker." That sums up what has been Engelbart's blessing and curse. It all began in 1951. Fresh out of the Navy, with a fiancee and a new engineering job at the precursor of today's National Aeronautics and Space Administration, Engelbart saw his future as a featureless hallway going on indefinitely. "I just thought," he recalls, "I've got a steady job, I'm going to get married and live happily ever after, and oh, my God, are all my life's goals already met?" The thought caused Engelbart to calculate how many minutes he would invest in his working life until age 60 (roughly 5.5 million) and what return he wanted on that investment. He considered changing careers. Then he hit upon the idea that would change his life: computers. "It was February 1951 when I had the picture," says Engelbart. "To think then of computers being devoted to supporting individuals sitting there interacting with them was crazy." Things might have been different had Engelbart's vision been confined to one or two notions about office automation. But his was a worldview, an overarching idea of how computers and humans could interact and of how information could be displayed, networked, organized, cross-referenced and logged to augment the collective IQ of organizations. Engelbart was finally able to pursue his dream in 1963, when he founded the Augmentation Research Center at Stanford Research Institute. That's when the innovations started to flow; from the mouse, to help menus, to becoming the second node on the Internet, much of what defines computing today was developed at ARC by Engelbart and his colleagues. In the cold. When the funding for ARC gave out in 1977, Engelbart took his crusade to the private sector, but he found himself in an intellectual wilderness where few understood his ideas and even fewer were willing to back them. "The rate at which a person can mature is directly proportional to the embarrassment he can tolerate," Engelbart said in a 1994 interview. "I've tolerated lots." Yet today, two Silicon Valley companies, Sun Microsystems and Netscape Communications, are working closely with Engelbart to create an alliance of business, government and civic organizations that will act as a prototype for many of his ideas. At its heart is the concept of bootstrapping, an engineering term describing a process in which the results of an action are fed back to achieve greater results more quickly with less effort. In practice, the alliance will involve organizations coming together in a dialogue that will be tracked and cross-referenced to build up a knowledge base. The dialogue will range from organizations communicating their needs to computer companies to more abstract ideas about the coevolution of computers and humanity. There is also a technological component. Although the alliance will be open to all, the enabling technologies will be Netscape's World Wide Web browser and Sun's Java language, which lets programs run over the Net. The idea is for users to migrate onto the Web so all data on an individual's desktop computer will be accessible at any time, from anywhere, using any PC. Engelbart remains hopeful. "In the late '50s and so many years afterward, I'd wake up in a sweat and say, `God, why am I doing this?' " he says. "But on the other hand, you think that as soon as the world learns how to get this value, it will make a big difference." And so Doug Engelbart, who grokked the digital future more than four decades ago, continues to wait for that future to grok him. Have a comment? Want to read what others have to say? Click here. © Copyright U.S. News & World Report, Inc. All rights reserved.